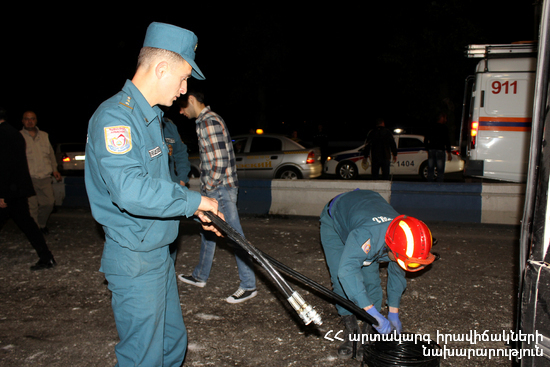 On February 9, at 21:21 information was received to “911” service that a car accident had occurred on the roadway from Hovtashat village to “Meimandar market”: there were casualties, the rescuers’ help was needed. It turned out that “Daewoo Espero” and “Nissan X-trail” cars had collided in front of one of the houses in Baghramyan street in Hovtashat village, Ararat province. Before the rescuers arrived at the scene two passengers of “Nissan X-Trail” had been taken to the medical center of Ejmiatsin town. According to doctors the casualties were in satisfactory condition. The rescuers rendered first medical aid to the drivers and the rest passengers of the cars and removed them to ambulance car. The casualties were hospitalized to “Erebouni” medical center.